Integrating lidar and BIM data with enterprise GIS helped provide 3D design and construction methods. 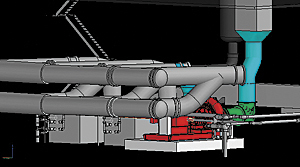 Viewing an intelligent 3D model provides insights that result in valuable questions and proposals. Extending BIM and lidar into the ArcGIS environment benefits from the integration points between the technologies. Interactive viewing of the 3D geodatabase in the ArcGIS Engine application, including dynamic symbolization of features. Milwaukee, Wisconsin, is the 26th largest city in the United States; its regional wastewater system is among the largest, most sophisticated, and well run in the country. The Milwaukee Metropolitan Sewerage District (MMSD) provides wastewater services for 28 municipalities comprising about one million people. The district's 411-square-mile planning area includes all cities and villages except the City of South Milwaukee. Serving these municipalities requires MMSD to develop spatial inventories and applications that meet internal and external needs for planning and design. Like any large facility, many of these efforts began organically within single departments to answer a specific need for one project. To ease the consolidation of facilities data information, MMSD called on HNTB of Kansas City, Missouri, a national infrastructure firm and Esri Silver Partner, to conduct a practical research project that pilots a data management approach for lidar and building information modeling (BIM) data. The project specifically studied the practical business applications integrating 3D design and construction data from an aeration system rehabilitation project into MMSD's enterprise GIS environment. As part of this research and development project, return-on-investment estimates were generated for distinct use cases, focusing on integrating lidar and BIM technology with GIS to greatly improve access and retrieval of as-built conditions for MMSD employees and their consultants. A number of different application development platforms and existing software solutions were considered for the project. Each software package was evaluated based on criteria defined by MMSD. ArcGIS Engine was selected as the platform that met all these requirements. ArcGIS Engine is a collection of GIS components and developer resources that can be embedded into other applications, allowing dynamic mapping and GIS capabilities in many different environments. MMSD was already a user of Esri technology, having adopted ArcGIS for Desktop software in 2003 for department-specific solutions. In 2009, MMSD consulted with HNTB to help facilitate the move into an enterprise environment using ArcGIS for Server. This was a multiphase implementation that included the development of a business data model. The data model focused on existing data inventory and application user needs at the time, including improving mapping and organizational efficiencies, as well as bringing added value to MMSD business operations. In 2011, MMSD completed the project, developing several applications that addressed specific areas to map related data to the district's infrastructure resources and to service areas. "Historically, information regarding water quality, water quality improvements, and physical features of water were located in separate departments at MMSD," says Jeff Siegel, GISP, associate vice president and technology solutions center director, HNTB. "Consolidation of this information took time, money, and executive sponsorship to change priorities. Now, all staff can access and output this information from their desktops without the help or sponsorship of other staff. The staff has the information it needs to make better and faster decisions, which was another of our guiding objectives." For this pilot project, among the many criteria MMSD had, data and document access was again selected as a high priority. "In this scenario, a 3D model was created and integrated into GIS," says Siegel. Again, the objective was for users to view and select features on their own. 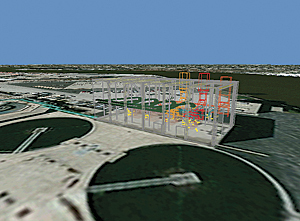 In this case, the 3D model would be displayed within an environment they are familiar with—the ArcGIS environment. Using this model, staff can access related data in external databases, including documents relevant to the 3D model feature the user selected. The study area included Jones Island Water Reclamation Facility, one of two wastewater treatment facilities within the district's service area. Jones Island is located on the shores of Lake Michigan in Milwaukee. On average, the Jones Island facility collects and treats a maximum daily flow of 300 million gallons of wastewater, returning clean, clear water to Lake Michigan. As part of the Milwaukee Metropolitan Sewerage District 2020 Facilities Plan, HNTB was tasked with developing design improvements for the Jones Island Water Reclamation Facility aeration system. The project will lead to a reduction of electrical energy usage through gains in aeration system blower and diffuser efficiencies, as well as enhancements to controlling air distribution to aeration basins and channels. The application employs dynamic linkages from the geodatabase to the building information model (BIM) for viewing greater 3D design detail. To gather accurate and precise as-built conditions of the aeration system, HNTB engineers decided to collect internal facility data to derive a BIM from static lidar point clouds. This approach quickly brought dependable and accurate existing conditions information to the designers in an interactive 3D design environment. "Because static lidar scanning is a direct line-of-sight method of data collection, the entire interior of a facility required enough scans for every single feature to be captured," says Siegel. "The estimated number of scans required increases based on the number of floors and the complexity of the building." A typical static lidar scan takes about 10 to 15 minutes. So a crew of two has the ability to scan anywhere from four to six locations—typically a room or hallway—in just one hour. For this project, more than 100 scans were collected in one day to gather point clouds of the entire facility. The decision to use BIM to manage the design process allowed many different disciplines to collaborate at different phases of the facility design project. BIM is defined as a process using a combination of technologies and resources to capture, manage, analyze, and display a digital representation of physical and functional characteristics of a facility. Integrating lidar and BIM data with MMSD's enterprise GIS was thought to offer many benefits to the agency. "In our opinion, this was the most well-organized way to package up and deliver all our 3D design and construction methods to our client," says Siegel. By extending BIM and lidar into the ArcGIS environment, the district can benefit from the data and integration points between the technologies, realizing significant operational efficiencies. Asset and facilities management is one area where improvements to maintenance management and document management systems can happen. The ability to manage data and keep a record of work orders and maintenance activity is invaluable to managers. Another area where the district is expected to realize efficiencies is in plant and facilities operations. "There are a number of ways a 3D, geographically based representation of the facilities will help our customer," says Siegel. "From safety and training to creating documentation and just having an operational database, GIS makes it easy to manage and use the collected information and model the facility dynamically in so many ways." Facility planning is another area where this approach can offer some real payback. From modeling proposed upgrades to capital improvements, the ease of sharing this information in an easily understandable format is a big win. "Since this is a historical landmark for the area, there are many complexities in maintaining the 3D model to the data management standards that MMSD expects," says Siegel. 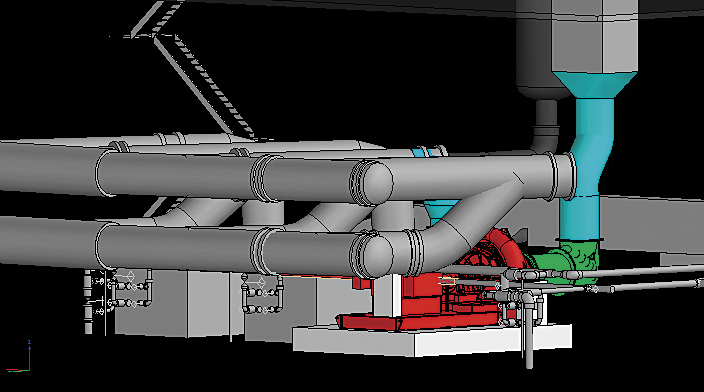 "Viewing a 3D model that is intelligent—meaning we can see more information about the facility picture we are displaying—makes it so much more efficient to answer questions, propose new scenarios, and move the projects along at a quicker pace." The most critical factor preventing more robust integration between BIM and GIS is the native incompatibility of the two data formats. A critical data integration fracture between BIM and GIS is the importance of defining spatial coordinates of the BIM file at the beginning of the project. "The purpose of this is to allow us and our client to accurately locate a building within a site and to give it a physical location context at larger scales that can be overlaid with aerial imagery and topographic and other layers from an enterprise geodatabase," says Siegel. For more information, contact Don Nehmer, Capital Program business manager, MMSD, or Jeff Siegel, associate vice president and technology solutions center director, HNTB Companies. For information on using GIS for facilities, visit esri.com/facilities.